Two deep sea divers in love with their breathing tubes connected! A real live undead mermaid tee! Get out your three piece suit with cuff links and a colorful paisley covered shirt or your hot pink ballroom gown with magical crystal slippers and blast off on a rock 'n' roll adventure. Includes the songs "Fertilizer" and "See Rock City Rock". Just as an evil inflatable alligator feels right at home in the pool you too will feel right at home in this tee. Your very own pet red ant. Easy to take care of and he even wears tube socks! What does "UL" stand for... why Uncle Larry of course! Uncle Larry's very first album. Includes hits such as the title track "Battery Acid Style" and "What Was That You Said?". 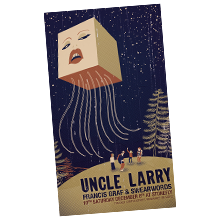 A clone of the discarded "Uncle Larry" tee that Billy Judge Baldus found and was inspired to name the band after it. A date by helicopter... the only way to go!